I'd mentioned earlier I sent in two magic items to the "OSR Superstar" contest over at Tenkar's, on a lark. I inexplicably made it to the second round, and due to random work events and my general ineptness, I didn't have a monster to send. So, punting, I sent what was on my mind, a reskinned stirge. The hook on it is that it's victims can be mistaken for a vampire, which will entertain a lower level party, or, irritate a higher level one. Originally submitted with Swords & Wizardry stats, I've added ACKS stats. I am, blissfully, out of the running now. A high window carelessly left open on a warm summer's night; that morning a fair maiden found dead, drained of blood, two puncture wounds in her neck. A town in panic; accusations fly, suspicions arise. A stranger burned at the stake; fear appeased, an uneasy calm. When struck with otherworldly horror, towns on the borderlands may have no sage to investigate, their priest or priestesses but herders of men, not hunters of monsters. Legends fly further than fact, and a murder blamed on occult practice or the cursed dead may not be what it seems. Enter then, the bludbetl - not quite beetle, not quite bee; not quite anything else; a visitor from an alien star in the baleful sky. The familiar split carapace of the terrestrial beetle, the color of a deep bruise, hide insectile wings, crimson veined. Where one would expect the thorax and head of a more familiar creature, one instead finds a flattened, fleshy worm-like protrusion, in some shade of chestnut. This 'head' hold the apparatus of the bludbetl; two clusters of blue beads for eyes, randomly numbered and ordered. A small 'nose', much like the end of a funnel, caps the end of this protrusion. On the underside, back from the funnel nose, are a pair of fatty lumps that release sharp fangs with which the bludbetl draws it's sanguine nectar from it's victim. The underside of the bludbetl transitions to a lighter carapace as one looks back towards the abdomen. 8 small legs with 4 joints end in small hands with 4 digits, one opposed to the rest. This thumb has a retractable claw, sharp as a razor, meant for fine work. The creature's 'forearm' is edged with a hard, serrated extrusion, much like a saw. The creature itself is no longer or wider than a man's face; it is flat, like a tick, and its abdomen bulges as it feeds. The bee-like nature of the bludbetl comes in its methods of reproduction. There are no queens; any bludbetl may reproduce itself asexually. A bludbetl will establish a nest in a remote location; they favor abandoned structures and caves, anywhere out of the weather. They will first produce a specialized type of larvae, a bludbetl-sac, which they care for for a time by harvesting and feeding it blood. The bludbetl-sac, when grown, serves as an air bladder and pump for the next stage of the nest. Fully grown they are slightly larger than a man's head; mostly a pale sac attached to what looks like an underdeveloped head of a bludbetl. This next stage is the establishment of a blood web. A large mammal, like a deer, hibernating bear, or solitary human is drained of blood to the point of unconsciousness. The victim is then vivisected; the heart, lungs, and circulatory system down to just above the capillary level (for example, in humans, to the level of the digital arteries and veins) are painstakingly removed and taken back to the nest. This may take a while if only a single bludbetl is at work; a swarm can harvest a victim in minutes. The arteries and veins are reconstructed back at the nest in a configuration compatible with the environment. The bludbetl excretes a paste from it's 'nose' to rejoin disparate parts. The bludbetl-sac pumps air into the lungs, and provides the stimulus necessary for the stolen heart to beat. The bludbetl attaches other larval sacs to this framework, which then hatch into true bludbetls within the season. The newly formed scourge then sets about expanding it's nest, adding more harvested respiratory and circulatory systems as required. The bludbetls crawl along their stolen vessels much like spiders as they care for their larvae. The sights and sounds of a bludbetl nest are something few men can forget. Bludbetls will viciously defend an established nest, a lone bludbetl will often escape to start elsewhere rather than risk it's life. The 'blood honey' in the larval sacs, if one can get over their natural revulsion to such an act, are much like the royal honey of giant bees, healing 1d4 points of damage via coating of the user's wounds. Bludbetls range for tens of miles each day seeking suitable victims; amongst humanity it is usually campers in small numbers, drunkards collapsed in the open, and sometimes, if a window is open, a maiden snug in her bed. Their touch is feather light, and their fangs are not felt. A single bludbetl can hold about a half-gallon, or 2 liters, of blood, enough to cause death for most humans. If the vivisected remains of a harvested victim are not found, it may be forever a mystery as to the true cause of death of the drained. Many a so-called vampire hunter has been led in circles following rumors and hearsay. I've driven to Utah and back in the past two weeks. That's some 2,600 miles, not including forays to Dinosaur National Monument, the Salt Lake, a "you dig it" trilobite fossil quarry, plus a quick jaunt to Fort Collins and Denver on the way in. I'd have to check the tripometer in the car, but I'm pretty certain we broke the 4,000 mile mark. It got me to thinking about scale, and maps I've drawn. Utah is a stunning expanse of mountains, green valleys, expansive deserts. The Salt Lake is...something I'll have a post on later, it's not something you can experience and not know exactly how to use it for a game. I'd been playing around and I ended up whipping up a campaign map for the kid's game, some time back. I could have used Autarch's completely viable blank hex maps, but I wanted something more "square", for various reasons. 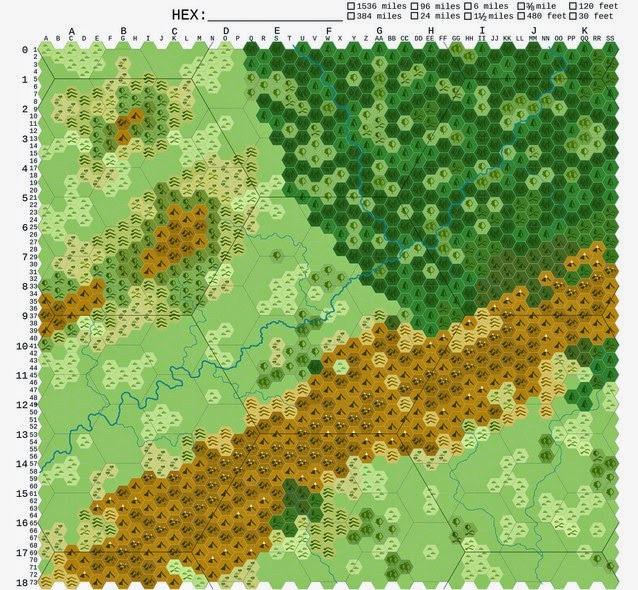 As it ended up, I also decided to put a third level of context in the hex map with 3 sizes of hex. Below, find the map. The largest hexes are 96 miles, the next smallest 24, the smallest 6 miles. Note my unused checkboxes - we can scale up to the largest hexes being 1,536 miles, and all the way down to where the smallest hexes are something under 2 feet. 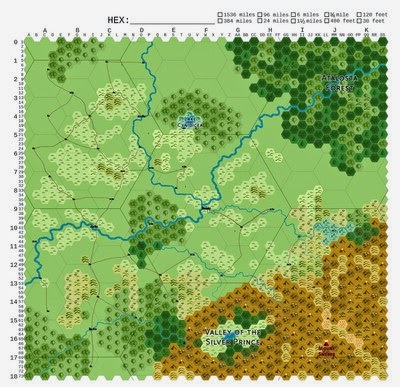 I think in general use I'd use the scale box to show what size the middle hexes are. I've actually used this to scale the map in and out - I have another one where the largest hexes are 24 miles, centered on the large city in the middle. 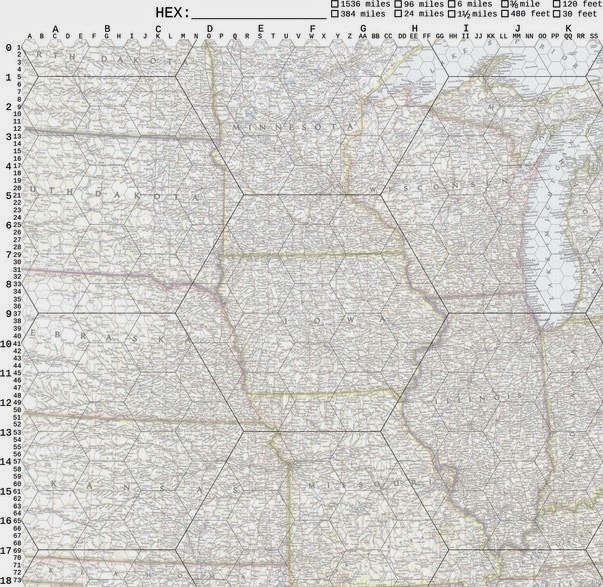 The zoom-out map has the largest as 384-mile hexes. It's not really automated at all. I have to redraw the map and re-realize the road and river paths at each scale, as well as decide out to re-detail mountains/forests and whatnot. So, it's serviceable. I made it by taking Hexographer output and painstakingly resizing things to match up under my grid overlay in GIMP, then, the usual adding layers of labels and features. If you look closely you'll see the ring of obelisks I described in my Baleful Sky: Alfim post, about 2 of the mid-size 24 miles hexes out from the edge of the northeastern forest. They're about 45ish miles apart. One thing I didn't necessarily think about when I did this was scale and geography. How does this compare to the real world? I realize, of course, it doesn't have to, but there's a simplicity inherent in not breaking from real-world geography. Thing is, I live in the midwest of the United States, and that gives me a concept of scale that's decidedly non-European. I look at a 96 mile hex and figure it'll take me maybe an hour and a half if there's a highway travelling through it, at most. I've driven to Florida 3 times in the past year and a half. I've just driven to Utah and back. It's a car culture, we get around - any drive around a hour in duration isn't a big deal, and a lot of people have a very high barrier to giving up and getting on a plane. And trains are re-friggin-diculous in this country, it's a damned shame. ACKS, however, is a decidedly Mediterranean game. It breathes a 'bowl of civilization' sort of theme, with multiple cultures coming into contact and conflict. It wants trade and travel and adventure. That sort of thing works in a game because it worked in history - tossing a whole bunch of cultures within arms distance of each other drove societal evolution. So what does some random town in Greece look like? I've centered on the town of Magiadar, which is now apparently called Fanos. 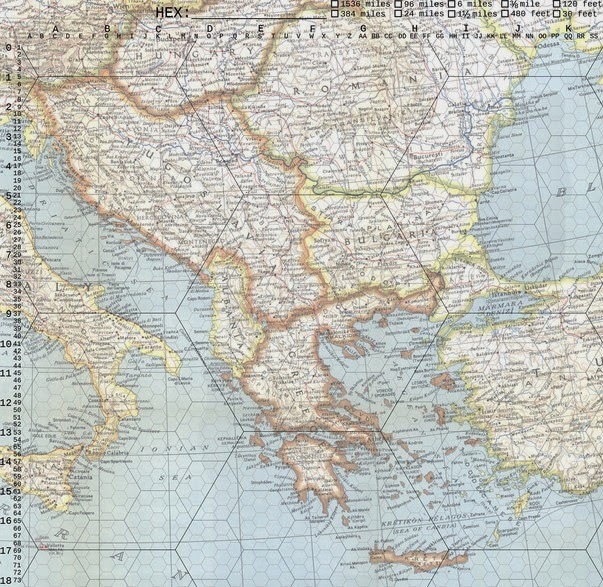 The map here is a WWII era map from NatGeo - this is at a 96 mile scale for the largest hexes. 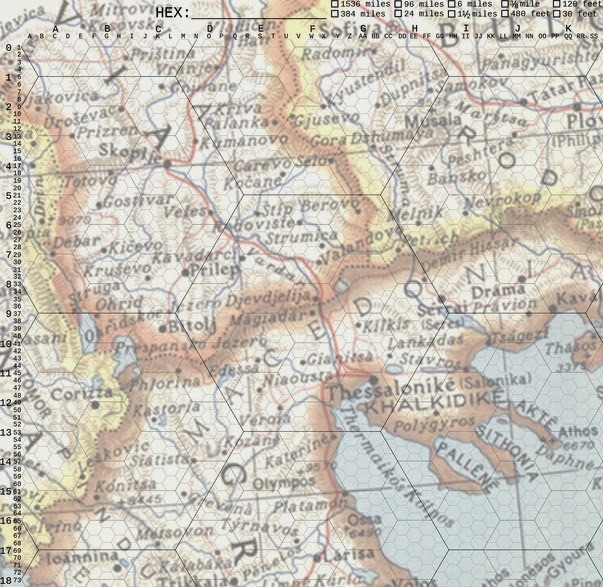 Already, I think, that's a little more adventuresome, there's a larger city about 40 miles away - Thessaloniki, the second largest and wealthiest city of the Byzantine Empire, at that, according to Wikipedia it's also the 5th best party city in the world, so get out your carousing rules. 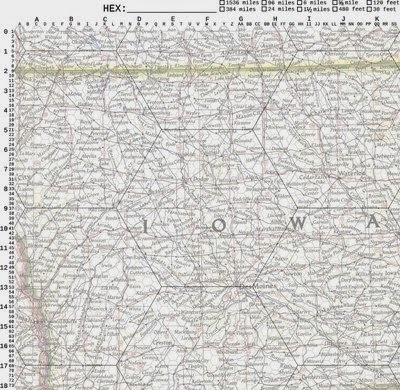 As a comparison, let's look at a map centered on Stratford, Iowa, done in the same style. This isn't terribly different from my map, actually. It's missing a mountain range to the southeast, and an alien Elfish forest to the northeast, but, other than that, we both have large swaths of flat land. Des Moines is ~50 miles away or so. If we zoom out a spot, however, and let our smallest hexes be 24 miles, what do we get? This would be ACKS' "campaign map", as opposed to the previous maps being our regional map. The large center hex is 384 miles. We gather two of the Great Lakes, and few more major cities. Historically, though, and as an American I will now revel in my shallow knowledge of history, especially in my own backyard, there's not a lot to be said. European settlers came in, and as they transformed into the United States, they pushed out and marginalized the native peoples. And the history of the first cultures of this land was lost under the history that was written by those who are now us. Or me, I don't know where you're from. Certainly the settling of wild lands is in the purview of a good DND game; but it works so much better when it's an empty land dotted with actual monsters, and not the chasing off of other humans. The thing with the European map is that there are natural boundaries - all those seas breaking up the landmass, plus a few well-placed mountain ranges. Boundaries that exist to isolate a population until such time as it can overcome those boundaries and meet other cultures help to diversify them. But, a broad stretch of plains is not a boundary, espc. not to a culture which is migratory. So, things are less different, and in a game sense, less fun. I may have just exploded a (soci/anthrop)ologist's head with the broadness of my brush on that statement. It's OK, I'm not, you know, learned on that sort of thing. I play a doctor on this blog. Might be familiarity. Maybe there's some old frustrated DM in Greece right now eyeing the northern Midwest as a vast span of trackless, dangerous land, full of plains dragons. I didn't actually draw this map out of pure chance - the kids did it for me, via Beyond The Wall's chargen playbook system. The eldest daughter rolled a Noble's Wild Daughter, which necessitated a castle, there in the center hex still. The wife rolled a Fae Foundling, so I needed a spooky fey forest, there in the northeast. The friend and his boys rolled their characters; an Heir to a Legend, a Forgotten Child, and a Local Performer, respectively. They commiserated a bit and came up with the Forgotten Child being the lost scion of a ruler recently overthrown by his uncle; and the Heir, related to the marshal of that ruler, whisked him away around the mountains to where the eldest daughter's family is, who now house him. So, I put that slash of a mountain range in between where they are now and where they need to go to reclaim that domain, down there in the southeast, at the confluence of those two rivers. There's a rugged way directly through that mountain range that serves two purposes - it allows a quick way to get through to that domain in the future, and it lets me introduce political conflict. I allied the two domains with each other - each was working on clearing the hexes that make up that mountain pass so they'd meet in the middle, to enable a quicker trade route (I imagine the ocean is just off the map to the south). That's an ACKSy thing to do for a domain ruler. However, the southern domain isn't going as fast as the northern - since this is now the usurper uncle, he's spending more on garrison costs to keep his realm together, rather than spending it on pushing through those hexes. Also very ACKSy! It's a good map for a kid's game - it's a very Beyond The Wall map - that mysterious forest where the eldest daughter's friend was born, those forbidding mountains across which lies the eldest boy's mortal enemy. Up on the 96-mile map at the top you'll see Lake Cynidicea, Mount Snurre, the Valley of the Silver Prince, all places where classic themes can be revisited. That last keep, there, deep in the mountain pass, two hexes north of the volcano - a keep right on the borderland of the unexplored pass. Big signs blinking "Adventure!" in neon shades. I don't expect the campaign to hold together very long, sports season is restarting for the boys and the father is a head coach for one of their football teams. But, if it does by some miracle, they've got directions to go and places to discover. Later, I think, I'll rework my hex overlay a bit and do a by-the-Autarchs campaign and regional map setup. It'll be a nice excuse to do a review of the core ACKS book without doing a review - the domain/realm construction and management rules are the jewel of the system, after all. So, there's something to think about. An expanse of vast grassland is going to have a much different sociological setup than one broken up by geological features, and that's something to keep in mind when deciding the theme of a campaign.